I recently came across a company called TShirtPrinting.net. I was sent a light blue t-shirt that had a monkey face, which I believe is their logo. It's not my colour of choice, but it's excellent quality. I have washed it once, and it didn't shrink, nor did the logo fade. 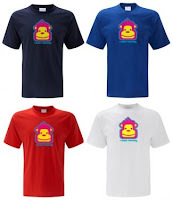 TShirtPrinting.net uses the t-shirt screen printing technology on various types of custom clothing items such as classic t-shirts, hooded tops, work wear and sweatshirts. On their website you can find many color options and garments. Suppliers include ScreenStars, Hanes, Gildan and Fruit of the Loom. Check their categories and browse through the printed men t-shirts, ladies t-shirts, kids t-shirts, hooded tops, sweatshirts, promotional clothing, vests and work wear and decide what suits you best.